Natural gas prices points towards a second consecutive day of losses. Downside risk continues for UNG as injection season strengthens. Triple digit inventory build is expected in the weeks ahead. As the market continues to seek a bottom, prices are becoming more and more attractive. With summer coming, bullish investors should be looking into taking advantage of prices which are at a bargain now. Selling pressure continues for a second day in a row as the market continues to price in the warmer weather outlook mid-late April and thus lighter national demand. Inventory builds in the coming weeks should approach if not surpass the triple digit mark. The front-month May futures contract pulled back an additional 2 cents (0.62%) to $2.57, as did the June contract which slipped to $2.61. Figure 1 below is a chart showing the price trend of NYMEX's front-month May futures contract over the past 7 days. 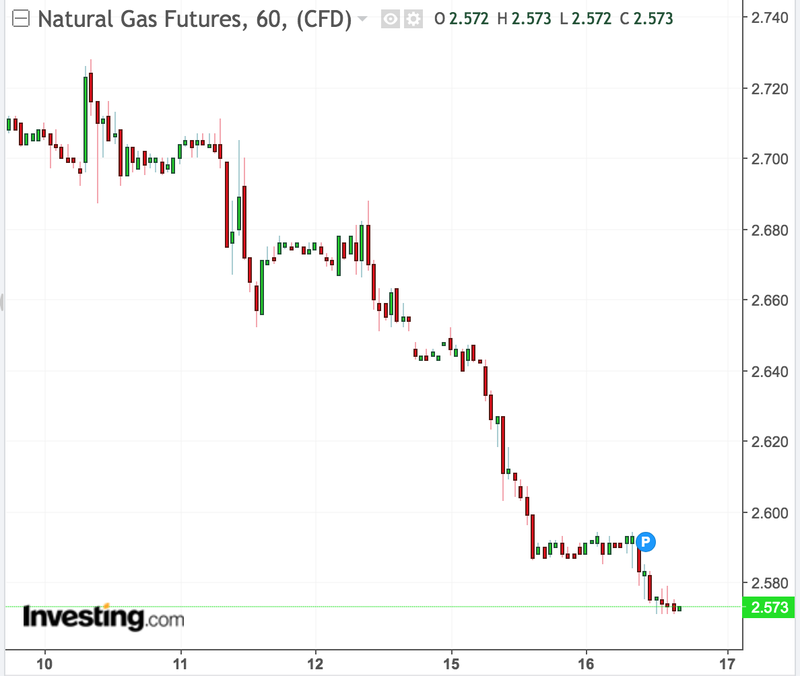 The United States Natural Gas ETF (NYSEARCA:UNG), which is the unleveraged 1x ETF that tracks the price of natural gas, closed Tuesday lower 0.61% to $22.66. The VelocityShares 3x Long Natural Gas ETN (NYSEARCA:UGAZ) and the ProShares Ultra Bloomberg Natural Gas ETF (NYSEARCA:BOIL) slid an additional 2% and 1.08% to $25.95 and $19.14, respectively. 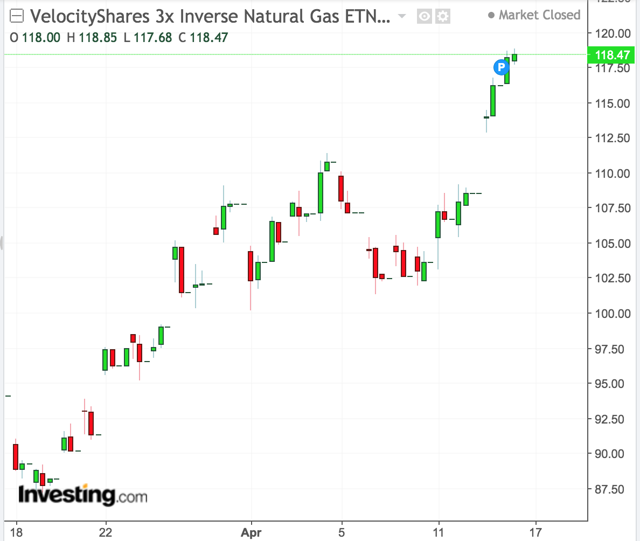 Meanwhile, the VelocityShares 3x Inverse Natural Gas ETN (NYSEARCA:DGAZ) and the ProShares UltraShort Bloomberg Natural Gas ETF (NYSEARCA:KOLD) increased another 2% and 1.23% to $118.54 and $23.91, respectively. Figure 2 below is a chart showing the price trend of DGAZ over the past month. Forecast models continue to show some mixed signals in terms of the precise location and extent of temperatures, but overall is still indicating a seasonable to unseasonably warm pattern in the 10-16 days. Figure 3 below is a comparison between the 12z GFS, ECMWF, and CMC's 10-16 day temperature outlook.